(Francisco Kjolseth | The Salt Lake Tribune) University of Utah athletic director Chris Hill reflects on his time at the U as he approaches his 30th work anniversary. (Francisco Kjolseth | The Salt Lake Tribune) Telling stories, University of Utah athletic director Chris Hill reflects on his time at the U as he approaches his 30th work anniversary. (Francisco Kjolseth | The Salt Lake Tribune) Telling stories, University of Utah athletic director Chris Hill reflects on his time at the U as he approaches his 30th work anniversary. (Francisco Kjolseth | The Salt Lake Tribune) University of Utah athletic director Chris Hill approaches his 30th work anniversary. (Francisco Kjolseth | The Salt Lake Tribune) University of Utah athletic director Chris Hill approaches his 30th work anniversary. (Francisco Kjolseth | The Salt Lake Tribune) Telling stories, University of Utah athletic director Chris Hill reflects on his time at the U as he approaches his 30th work anniversary. (Francisco Kjolseth | The Salt Lake Tribune) University of Utah athletic director Chris Hill approaches his 30th work anniversary. 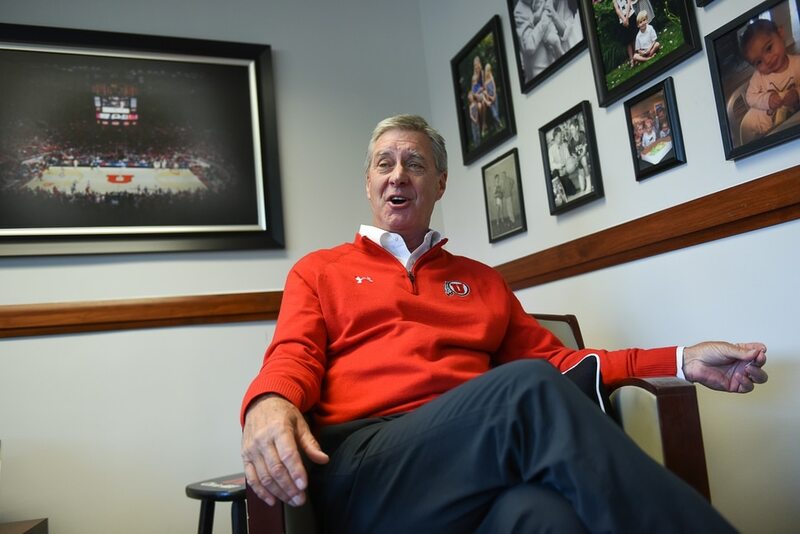 (Francisco Kjolseth | The Salt Lake Tribune) Telling stories, University of Utah athletic director Chris Hill reflects on his time at the U as he approaches his 30th work anniversary. 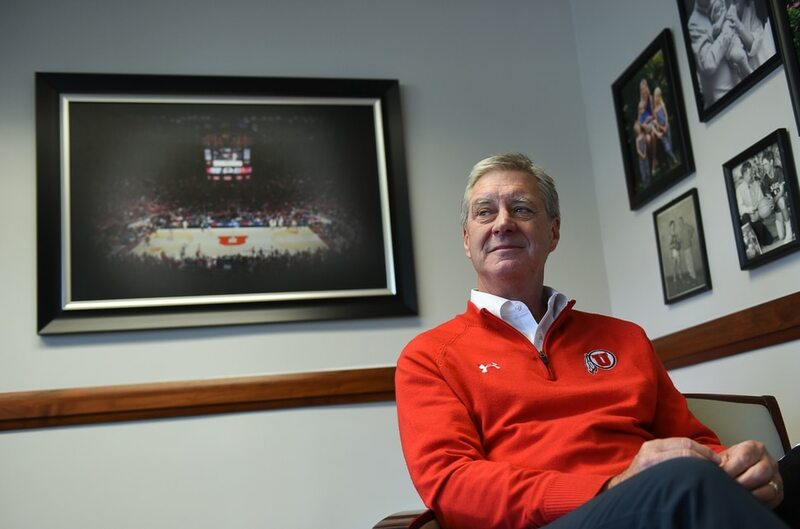 (Francisco Kjolseth | The Salt Lake Tribune) Telling stories, University of Utah athletic director Chris Hill reflects on his time at the U as he approaches his 30th work anniversary. (Francisco Kjolseth | The Salt Lake Tribune) University of Utah athletic director Chris Hill approaches his 30th work anniversary. After a streaker ran onto the field at halftime, Chris Hill watched Utah State scored 24 straight points in the second half of a football victory. The Aggies celebrated by parading on the “UTAH” painted above the north end zone of the stadium on a sunny, late October afternoon in 1987. In 30 years, Hill’s trajectory as the University of Utah’s athletic director has been favorable. “He’s gone through a lot of trials and tribulations, but he’s still a man who’s standing,” said Nona Richardson, a longtime college administrator who recently became a Ute senior associate AD. In Hill’s case, those include a rotating cast of school presidents, athletic department employees that now number 180 (roughly quadrupled in 30 years), the school’s 435 student-athletes, major boosters and rank-and-file fans who advocate projects such as the upcoming expansion of Rice-Eccles Stadium — and want it done right now (it will happen). • NCAA basketball championship game, 1998. • Fiesta Bowl victory to complete 12-0 season, 2005. • Sugar Bowl victory to complete 13-0 season, 2009. • NCAA skiing championship, 2017. • Firing of inherited coaches Lynn Archibald (basketball) and Jim Fassel (football), 1989. • Firing of football coach Ron McBride after 13 seasons, 2002. • The complicated ending of basketball coach Rick Majerus’ tenure, 2003. • Admonished for handling of swimming program troubles, 2013. • Contract issues with football coach Kyle Whittingham his staff, 2014. Hill needed three attempts to adequately replace basketball coach Rick Majerus, dealt with the fallout of having a swimming coach accused of mistreating athletes and had to mend a relationship with football coach Kyle Whittingham in recent years. Whittingham should value Hill. His own salary has grown exponentially to $3.6 million (Hill earns about $1 million) and so has the size of the football support staff, working in the new Spence and Cleone Eccles Football Center. That’s partly a function of competing in the Pac-12, with the league’s 2010 invitation creating a new dynamic for Hill’s program as annual revenue has grown to $76 million. “The numbers are just mind-boggling,” said Ute women’s soccer coach Rich Manning. The Utes have loyal donors, although fundraising is not always as easy as the time Hill sought a $100,000 gift from the Dumke family to help build Rice-Eccles Stadium and ended up receiving $1 million for a gymnastics building. (Tribune File Photo) Granger high basketball coach Chis Hill, December 1978. (Tribune File Photo) University of Utah Athletic Director Dr. Chris Hill, October 24, 1987. (Tribune File Photo) University of Utah Athletic Director Dr. Chris Hill gives an interview to the Tribune in his office, November of 1987. The 37- year-old Hill was named athletic director a month earlier and he talked his objectives in administering the schools approximately $6 million athletics budget. (Tribune File Photo) University of Utah Athletic Director Dr. Chris Hill gives an interview to the Tribune in his office, November of 1987. The 37- year-old Hill was named athletic director a month earlier and he talked his objectives in administering the schools approximately $6 million athletics budget. (Tribune File Photo) University of Utah Athletic Director Dr. Chris Hill gives an interview to the Tribune in his office, November of 1987. The 37- year-old Hill was named athletic director a month earlier and he talked his objectives in administering the schools approximately $6 million athletics budget. (Tribune File Photo) University of Utah Athletic Director Dr. Chris Hill gives an interview to the Tribune in his office, November of 1987. The 37- year-old Hill was named athletic director a month earlier and he talked his objectives in administering the schools approximately $6 million athletics budget. (Tribune File Photo) University of Utah Athletic Director Dr. Chris Hill, November 29, 1989. (Rick Egan | Tribune File Photo) Rick Majerus and Chris Hill giving a speech in front of the media. (Tribune File Photo) University of Utah Athletic Director Dr. Chris Hill, October 16, 1990. (Tribune File Photo) Megan Jensen (Utah high school female athlete of the year), Jeff Hopkinson (Utah high school male athlete of the year), Betty Borden (MS Champion of the Year), Dr. Chris Hill (Sports Person of the Year) at dinner on September 25, 1996. (Rick Egan | Tribune File Photo) Chris Hill (dad) Aly Hill (daughter) Kathy (wife and mother) Christopher HIll (son). (Tribune File Photo) Athletic Director Dr. Chris Hill listens as Coach Rick Majerus talks to the media at a press conference dealing with NCAA sanctions on July 30, 2003. (Tribune File Photo) Dr. Chris Hill, Director of Athletics at The University of Utah, is all smiles as he answers questions about his pick for Utah's new head basketball coach, Ray Giacoletti, on March 31, 2004. (Tribune File Photo) University of Utah's athletic director Chris Hill on March 22, 2005. (Tribune File Photo) University of Utah Athletic Director Chris Hill photographed at the Huntsman Center on August 16, 2007. (Francisco Kjolseth | Tribune File Photo) University of Utah Athletic Director Chris Hill photographed at the Huntsman Center on July 1, 2008. (Scott Sommerdorf | Tribune File Photo) Utah athletic director Chris Hill applauds for the Utes' 12-0 season as he opens the BCS announcement party held at Rice-Eccles Stadium, Sunday, December 7, 2008. (Scott Sommerdorf | Tribune File Photo) University of Utah athletic director Chris Hill (left) and Utah head football coach Kyle Whittingham walk to the podium together to announce the new contract extinction for Whittingham on Monday December 29, 2008. The terms of the deal were announced as 6 million over 5 years. (Tribune File Photo) University of Utah women's basketball coach Elaine Elliott, left, talks with director of athletics Dr. Chris Hill after a press conference Wednesday, March 31, 2010 at Huntsman Center on the campus of the University of Utah in Salt Lake City. Coach Elliott announced she will take a one year leave of absence while she considers retirement. (Scott Sommerdorf | Tribune File Photo) University of Utah President Michael Young (left) holds his grandson Bryce Owen (1 and a half years), in his lap as he spoke about the University's acceptance of the Pac-10's invitation to join the conference on Tuesday June 17, 2010. At right is Athletic Director Dr. Chris Hill. (Scott Sommerdorf | Tribune File Photo) Utah Athletic Director Dr. Chris Hill explains why the decision was made to fire Jim Boylen in the Huntsman Center Lounge in front of the portraits of former Utah basketball coach Vadal Peterson (left) and former Utah Director of Athletics James Bud Jack. The University of Utah announced that head basketball coach Jim Boylen had been fired, Saturday, March 12, 2011. (Scott Sommerdorf | Tribune File Photo) Direcotor of Athletics, Dr. Chris Hill introduces the new mens basketball coach at the University of Utah - Larry Krystkowiak - at a press conference held at the University, Monday, April 4, 2011. (Scott Sommerdorf | Tribune File Photo) Utah athletic director Chris Hill, left, Utah interim president Lorris Betz, and Pac-12 commissioner Larry Scott hold up a football jersey commemorating the day as the University of Utah officially became a member of the Pac-12 conference on July ,1 2011. (Al Hartmann | Tribune File Photo) University of Utah Athletic Director Chris Hill introduces Pac-12 Commissioner Larry Scott at a press conference at the Utah Natural History Museum Thursday February 9, 2012, before the start of the Front Porch forum of the PAC 12 presidents. (Al Hartmann | Tribune File Photo) University of Utah President David Pershing, center, prepares to introduce Pac-12 Commissioner Larry Scott, left. University of Utah Athletic Director Chris Hill, at right. PAC 12 presidents are meeting in Salt Lake City for the first time ever at a Front Porch forum Thursday February 9, 2012, at the Utah Natural History Museum. (Trent Nelson | Tribune File Photo) Utah athletic director Dr. Chris Hill and Jodi Majerus (sister of former Utah basketball coach Rick Majerus) take in the moment as coach Majerus' sweater is retired into the rafters of the Huntsman Center, as Utah hosts Colorado, college basketball Saturday, February 2, 2013 in Salt Lake City. (Al Hartmann | Tribune File Photo) University of Utah Athletic Director Chris Hill responds to the results of an investigation of former University of Utah swim coach Greg Winslow in a press conference in Salt Lake City Tuesday July 2, 2013. (Al Hartmann | Tribune File Photo) University of Utah Athletic Director Chris Hill, left, listens to Alan Sullivan, Investigator for Snell & Wilmer present results of investigation of former University of Utah swim coach Greg Winslow in a press conference in Salt Lake City Tuesday July 2, 2013. (Scott Sommerdorf | Tribune File Photo) Utah Athletic Director, Dr. Chris Hill speaks on his phone as the Utes practice at the Moda Center in Portland, Wednesday, March 18, 2015. (Rick Egan | Tribune File Photo) Utah athletic director Chris Hill hugs Greg Marsden, after a news conference at the Huntsman Center, Tuesday, April 21, 2015. (Leah Hogsten | Tribune File Photo) Lynne has worked in some challenging situations and been successful with that, said University of Utah athletic director Chris Hill (right) of Lynne Roberts (left) who is the new women's basketball coach Wednesday, April 29, 2015 at the Jon M. Huntsman Center. (Steve Griffin | Tribune File Photo) Utah athletic director Chris Hill and Jon and Karen Huntsman laugh as University of Utah head men's basketball coach Larry Krystkowiak talks during grand opening ceremony of the Jon M. and Karen Huntsman Basketball Center on the University of Utah campus in Salt Lake City, Thursday, October 1, 2015. (Rick Egan | Tribune File Photo) Utah Athletic Director Chris Hill defends the decision to cancel next season's Utah-BYU basketball game during a press conference at the University of Utah, Monday, January 11, 2016. (Scott Sommerdorf | Tribune File Photo) Utah athletic director Chris Hill watches as Utah basketball defeated Washington State 88-47, Sunday, February 14, 2016. (Rick Egan | Tribune File Photo) Left to Right - Tom Holmoe, Athletic Director, Brigham Young University; Chris Hill, Athletic Director, Steve Starks, President, Larry H. Miller Sports & Entertainment/Utah Jazz; University of Utah; John Hartwell, Athletic Director, Utah State University; Jerry Bovee, Athletic Director, Weber State University gather together for a group photo after announcing the new menÕs college basketball showcase featuring BYU, Utah, USU, and Weber State, at Vivint Smart Home Arena, Thursday, July 21, 2016. (Scott Sommerdorf | Tribune File Photo) University of Utah athletic director Chris Hill looks through a yearbook from his time at Granger High School, Thursday, February 9, 2017. Early in his career, Hill spent four years at Granger High as a math teacher and basketball coach. (Scott Sommerdorf | Tribune File Photo) University of Utah athletic director Chris Hill's photo of him as a young man is found in a yearbook at Granger High School, Thursday, February 9, 2017. (Scott Sommerdorf | Tribune File Photo) University of Utah athletic director Chris Hill poses in a math classroom, Thursday, February 9, 2017, with an equation like the ones he taught during his time there as a teacher. Early in his career, Hill spent four years at Granger High as a math teacher and basketball coach. (Rick Egan | Tribune File Photo) University of Utah Athletic Director, Chris Hill with Lacrosse coach Brian Holman, as the U of U announces that it will add men's lacrosse as a division 1 sport in a news conference at the Spence and Cleone Eccles Football Center, Friday, June 16, 2017. (Rick Egan | Tribune File Photo) University of Utah Athletic Director, Chris Hill announces that the University of Utah will add men's lacrosse as a division 1 sport in a news conference at the Spence and Cleone Eccles Center, Friday, June 16, 2017. Utah is about to welcome a sixth president to the campus in Hill’s tenure, another changing element of his job. Hill himself could have gone to Washington in 2004, but chose to stay in an athletic department known for stability and a family atmosphere. In Hill’s tenure, football’s Urban Meyer (Florida) and softball’s Jo Evans (Texas A&M) are the only head coaches who left Utah for bigger jobs. He was 37, eight years removed from teaching math at Granger when Utah president Chase Peterson promoted Hill from director of the Crimson Club. “Oh, I wasn’t prepared at all, in a lot of ways,” he said. Hill learned from veteran administrators in the Western Athletic Conference. “Guys, I’m going to need some help,” he told San Diego State’s Fred Miller, Hawaii’s Stan Sheriff and others. Hill keeps looking forward, even after 30 years on the job. Whenever his career ends, the hiring of football coaches Ron McBride, Meyer and Whittingham will rank among Hill’s best moves — mixed in with the firing of the popular McBride, who’s now in the school’s Crimson Club Hall of Fame. Majerus’ successful run as basketball coach preceded the brief stays of Ray Giacoletti and Jim Boylen, before Hill landed Larry Krystkowiak in 2011. Among Hill’s favorite stories is how his wife, Kathy, hired Meyer. During the interview process, she took a call from Meyer and urged him to get to Salt Lake City, because he was the school’s No. 1 choice. She may have weakened the Utes’ bargaining power, Hill jokes, but they got him. Good call. Majerus took the Utes to the 1998 NCAA championship game, during an adventurous, and sometimes controversial, tenure. Gene Smith, now Ohio State’s AD and a longtime friend of Hill’s, was a member of NCAA Committee on Infractions in 2003 when Majerus’ program committed minor violations. “As challenging as it was to manage him … Chris did a masterful job with that,” said Smith, an admirer of Majerus’ work. Smith said working at one school for a long time requires “staying cutting-edge,” as Hill has done. The adaptability covers everything from facilities to food. 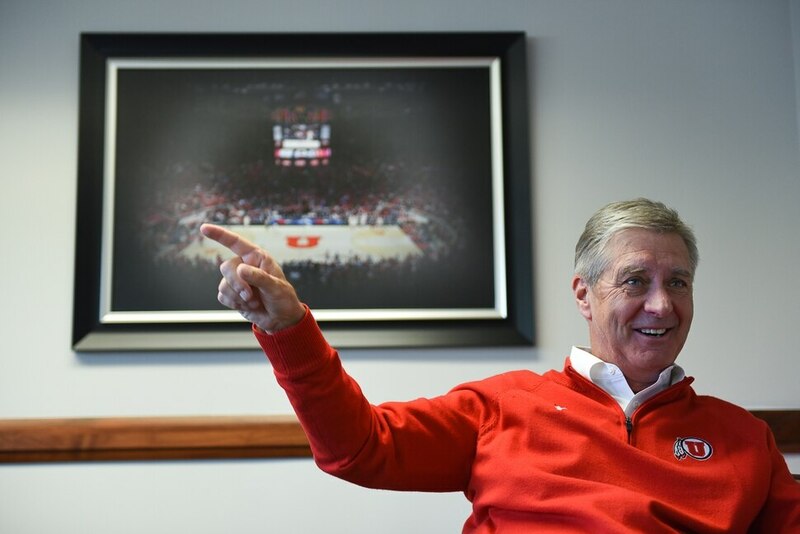 Now, at age 67, Hill remains energized by Utah’s future and other issues in athletics. He’s motivated to fix basketball’s recruiting problems, joining Guerrero on a Pac-12 task force.